Like the sea in the doldrums. 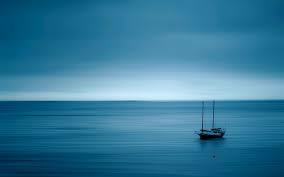 The problem is that boats ain’t moving in the doldrums, at least not ‘real’ boats – that is those with a sail. Never before have I felt so much at the mercy of life and of others as over the past two years. I’ve written about this feeling of absolute and utter helplessness and sadness that is so difficult to deal with at times. But there is another side to this previously unknown feeling of what seems to be, often, an almost complete dependence on others. It has got to do with institutional care. With doors and doors of fridges being locked. With the need of having to ask for almost every essential thing. With autonomy being removed from your life. A lot of that, while I find it difficult to deal with, I understand and can live with – especially if those restrictions are ‘sweetened’ by extremely helpful and understanding people around. But part of the institutional care is also a momentum (in German I’d call it “Eigendynamik”) that is just there. Things almost happen by themselves, they happen because because that’s the way they are done. They are the system. Like ‘team decisions’ where no individual is responsible for anything anymore. Like medicine that is being given because it’s safer, because it easier, because because everybody gets it. Like treatment or therapy that is not provided because because it’s not worth it. Like procedures that are being done because because they are always done, no matter whether they were done somewhere else before. Like precautions that are introduced when previous experience, if considered and taken seriously, would deem them unnecessary. This is when common sense and logic are replaced by what Kafka called the “Prozess”, by the “system’s requirements”, by “someone” insisting on something when this “someone” is never identified and most likely doesn’t even exist. Today was one of these days when I was confronted with the “momentum”. But ships don’t move in the doldrums. Not even the Dreamboat. You also created a new “movement” a new brise that is moving gently but firmly in the right way. Don´t worry things are getting on their way. You will reach your goal.